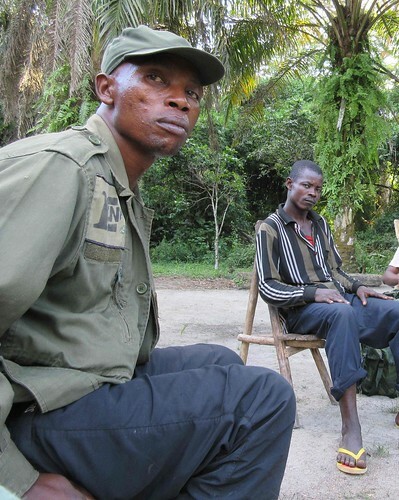 Blood-letting and blood-loyalty beside Lomami National Park. Omo on a patrol to prohibit pigeon captures in the park. OMO or O2 : Our trip was planned for Saturday the 4th March, but we did not take off until Sunday. 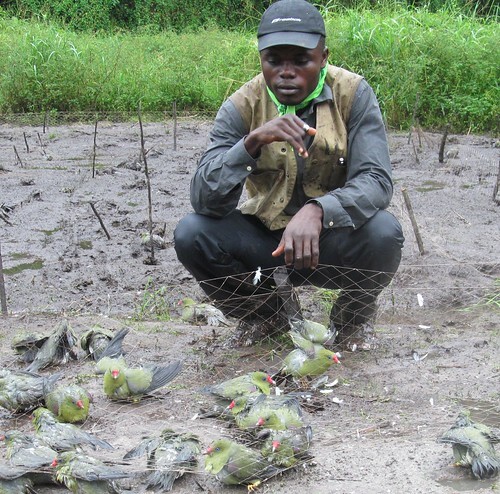 I was making a monthly trip to pay salaries, distribute operating funds for the month, and collect field data at two of our field bases, ChombeKilima (CK) and Oluo. Manaka (my motorbike driver) and I quit Kindu at 9h and stopped in Dingi. I met with Benjamin, leader at the park guards’ training center. We shared a beer with Leon (of our TL2 project) who was returning from a mission in the north at Balanga Ouest. We continued at 1 PM. After crossing the Kasuku River we passed through Makoka village at about 4 PM. Deka, from the village of CK was on his motorcycle behind us. He drove so poorly, we almost let him pass for fear he might hit us from behind; but instead we stopped and I lectured him to maintain a safe distance. This turned out to be very fortunate. Omo’s route on the 5th of March 2017. Not more than 50 meters beyond, we came up from a wooded stream onto a short savanna patch. We slowed way down as the path was narrow and broken into eroded ridges. We heard a loud bang whose impact threw us to the ground. My first reaction was “a blown tire”. My body felt nothing. I got up to inspect the motorcycle, but Manaka began to flee. As I approached to see the tire I heard a voice cry in Swahili “They shot them!!”. It was Deka coming behind us. We’d been shot! I quickly turned to follow Manaka. It was then I began to feel an incredible heaviness in my right leg and arm. When I reached Manaka my first thought was to see who did it. I said lets stay hidden in the grasses where we can see who comes forward. Manaka looked at me, but turned to flee towards the trees. It came to me that I was like someone bewitched, waiting to meet my death. I fled after Manaka and saw that his shirt was covered with blood. My arm and leg were very heavy and I could feel the pain rising – movement cost incredible determination. I refused to look. We were near the small stream when we heard Deka calling us. I kept Manaka from answering instead we went slowly through the trees to try to see – was he alone? Was the attacker there? And Who would attack us, anyway? 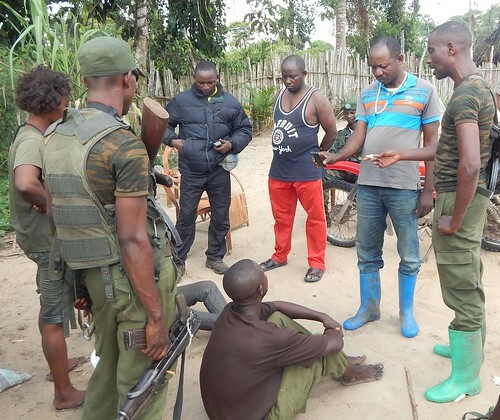 I could only think that it might be the family of the poacher recently killed by one of the eco-guards. Who else could it be if not that family? Deka was alone on the path calling for us, only women washing clothes were nearby. We came out of the trees. 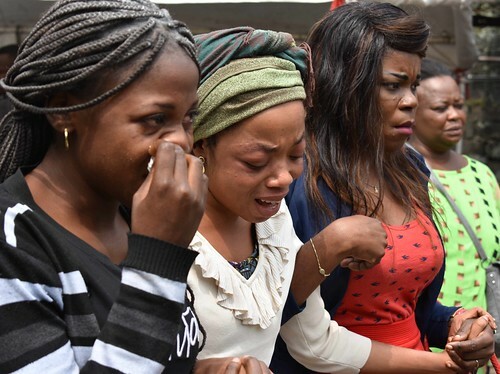 When the women saw Manaka covered in blood they fled. We now advanced with Deka, back towards the village of Makoka; that was our only hope for help. This near-by village is the size of Makoka. I moved by little jumps, I could only put weight on my left leg. I could no longer move my right arm. Deka carried Manaka on his back, Manaka’s arms around Deka’s neck. All of this in maybe 20 minutes from when the shotgun attack threw us down. I got to the village first. I was in a state of anxious confusion; I suspected everyone. I did not want the villagers to see that I was wounded, but could not hide the limp. I put my hand in my pocket as blood was dripping down my fingers. Now it pooled in my shoe. I tried to walk upright. 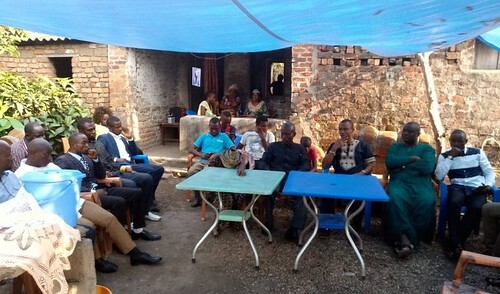 A recent meeting in Makoka showing a building the size of the dispensary with writing on its wall. I went straight to the so-called dispensary. There was no one competent, and no materials or useful medicine at all, even for simple first aid. I despaired. Deka then stumbled into the village, releasing Manaka next to me. I too slumped to the ground and the blood pooled around us. Villagers gathered. Just then the groupement chief came up; the passenger on Deka’s motorbike had run ahead to alert him. 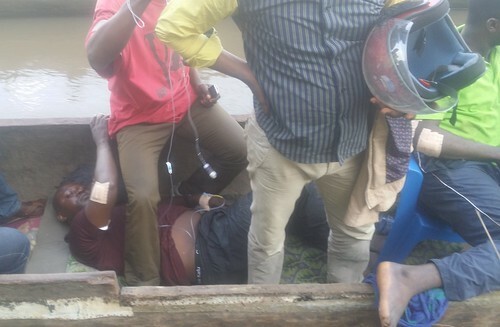 He was surrounded by others…they decided to go straight back to the motorbike to see what they could find. JUNIOR: I arrived in Chombe Kilima (CK) the 3rd of March, having walked across the park from Katopa camp. 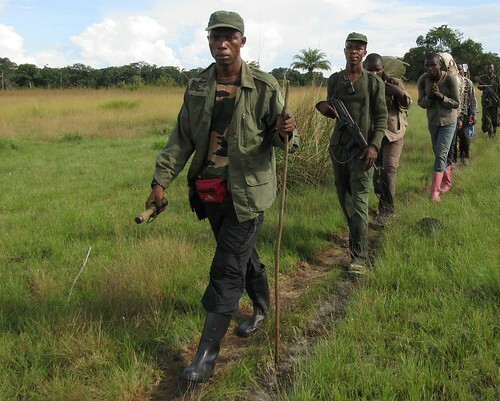 I had to work with the patrol teams from CK and Oluo then I would return to Kindu. 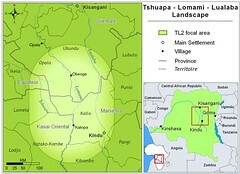 I already had satellite communication (thuraya) with Omo in Kindu. I would return with him. 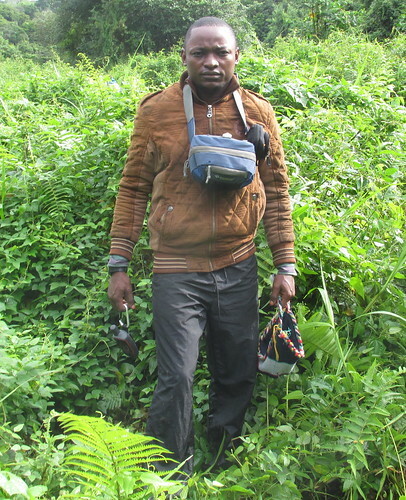 He was coming to pay salaries in CK and Oluo and he was coming with a second moto to carry provisions for the teams. I would return on that moto. 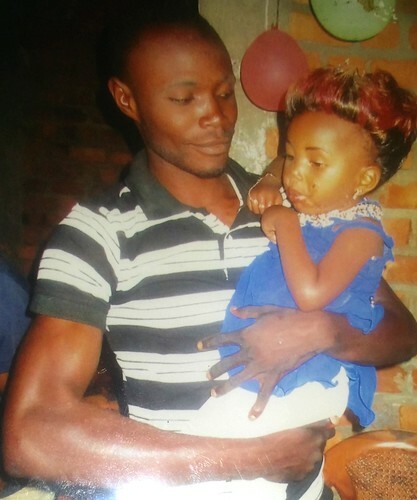 Photo of Michel with Manaka’s daughter. 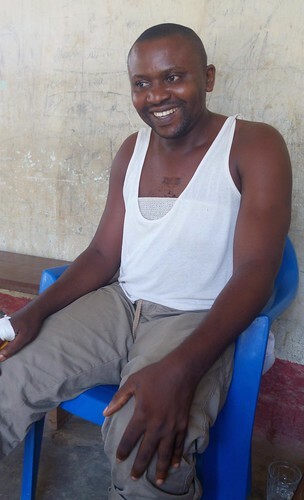 Manaka had befriended him and helped get him jobs with the TL2 project. I was working with the notes of the patrol teams on Saturday the 4th of March when the moto-taximan we often used, Michel, arrived with the provisions on his motorcycle. 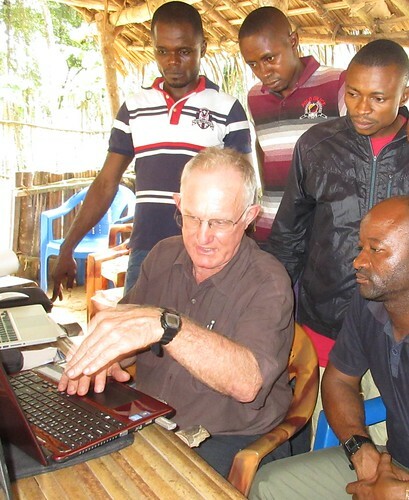 I asked him where Omo and our project driver, Manaka, were…we expected them to come together. He assured me that they were behind, but that they would come this same Saturday. He, Michel, would be my driver on Monday the 6th. He dropped the load and left quickly. His family home was nearby. Omo and Manaka did not come Saturday. I worked all day Sunday, the 5th of March with the teams. About 4:30 PM the batteries of our computers had no more charge. Because I had to finish the work with the teams before leaving the next day, I sent Maga to Makoka to recharge the batteries on a generator there. Michel had left his motorcycle at our compound. Maga took Michel’s little brother as his driver and took off immediately. 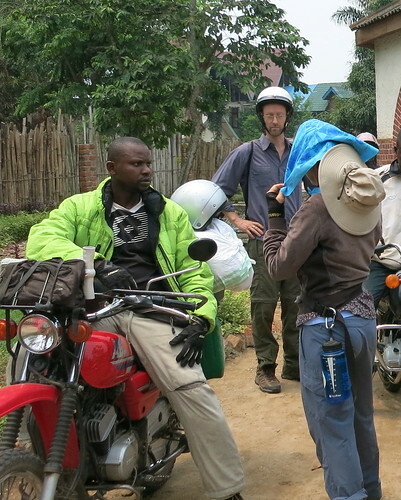 On the savanna before arriving at Makoka, Maga saw the project motorbike lying by the side of the road. He stopped and began calling, “Omo” “Manaka”, at the top of his voice. A large group of villagers from Makoka come out on the savanna. Very soon a large group of villagers comes out of the trees, led by the chef de groupement. 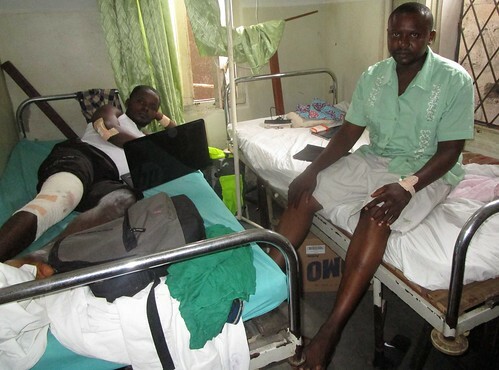 They tell Maga about the attack and that Omo and Manaka are already in Makoka, Manaka in serious condition. 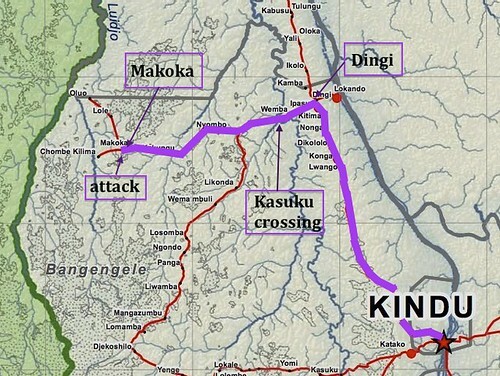 Maga immediately sent the village chief of Makoka back to me in Chombe Kilima to explain what happened and so that I could send a satellite message to Kindu. Maga, himself, returned on foot with the rest of the men to Makoka. Earlier photo of Omo with John and several team leaders. I wondered where I could find a motorcycle. Finally one came along the road from Dingi. Manaka had to get out first, his hemorrhage was terrible. The driver accepted to take him to Kindu and I found someone to sit behind to hold him on the motorbike. I needed to find another motorbike. Then I saw the chef de groupement return and he was with Maga and also our motorbike. I saw immediately that my pelican case was no longer on the moto…only a large bag of beans and my small sack with my clothes. It was only then that I understood that we were shot in order to steal our money – I had over 3000 dollars in the pelican case — but who ?? Maga (red pants) assisting at an interrogation the next day, Junior in jacket next to him. Maga helped me find someone to drive our motorbike and someone to steady me from behind, as I was weakening fast. It was at 6 PM that I too was evacuated in the direction of Dingi. Within an hour and a half we had caught up with Manaka’s motorbike. We continued together. 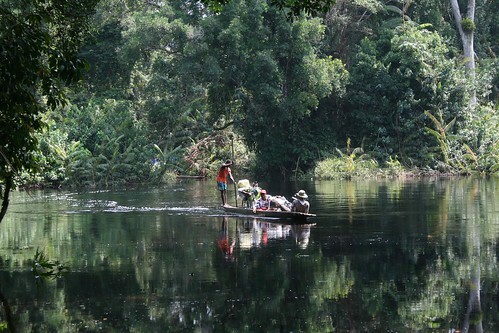 First problem was the Kasuku River crossing after dark. There was no one there to cross us; both dugout and paddles were hidden. Fortunately one of the boys transporting me had worked the crossing. With a flashlight they found the dugout but not the paddles. He used his plastic sandals to paddle us and motorbike across. By then 10:00 PM. Guard Benjamin in a village. We met Benjamin, from the Dingi guard training camp. He was coming to help, the message of our attack had been sent. He turned around and we all got to the camp by about 11 PM. But their small dispensary had nothing helpful. Manaka was losing the most blood and was weak near unconsciousness…so the camp nurse administered a shot of vitamin K3 that they found in the village pharmacy. 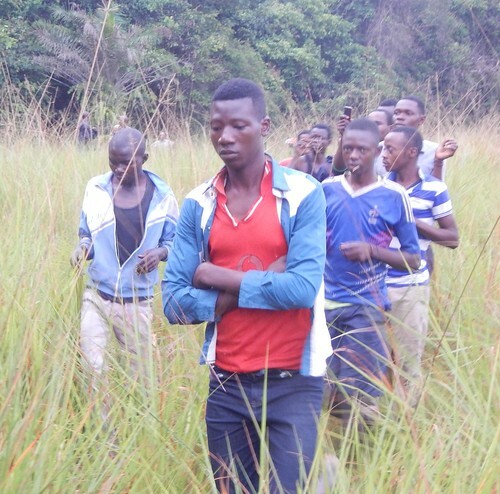 There was no option; I was determined that we continue towards Kindu…another two or three hours…to get treated in a hospital. Towards one in the morning Benjamin gave us three eco-guards and a motorbike to continue to Kindu. At 5 km from Dingi we met Dr John Mupepa and TL2’s other chauffeur, Guylain. They were sent with basic medical supplies to give us emergency first aid. We returned to the training camp. The electric generator worked all night. Dr John found four shotgun lead impacts on Manaka’s body. A superficial one on the right arm he could take out, but not the ones causing the heavy hemorrhage in his back and stomach. Nor could he extract the one in his right thigh. None of mine could be extracted. Two were to the knee, one near the elbow. Another in the lower arm and one to the thigh. He disinfected and bandaged all the wounds and put Manaka on much needed intravenous serum. Above the rescue dugout. Omo sat in a chair and Manaka lay on a mattress continuing intravenous serum. The base in Kindu sent a dugout to Lokandu (five miles from Dingi, on the Lualaba river) to evacuate us the morning of 6 March. In Kindu we were transferred to the general hospital. 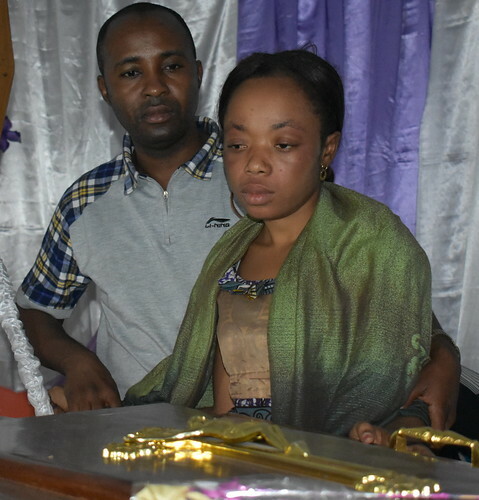 Picture of Omo and Manada after being transferred to Kinshasa where most of the extractions took place. JUNIOR: Maga sent the chief of Makoka to give me the news. The little brother of Michel, who had reported Michel’s continuous presence at the savanna edge, was held as first informant. I sent a thuraya message immediately to our TL2 base in Kindu, we started to assess what 12 caliber shotguns were not in the village of CK. We knew who owned them. It was Longo who said that Michel had his shotgun and that he took it yesterday, Saturday – the same day he came from Kindu – in fact he must have gone straight to Longo’s on his arrival to CK. Michel led us to where he left the shotgun. 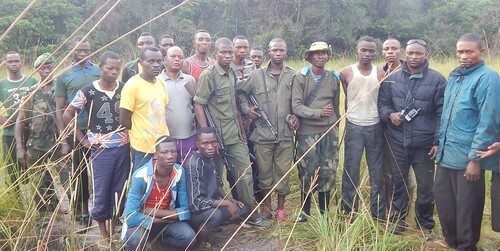 The group of us who arrested then followed Michel out on the savanna.The groupement chef on the far right, next to Junior. Michel in white undershirt. 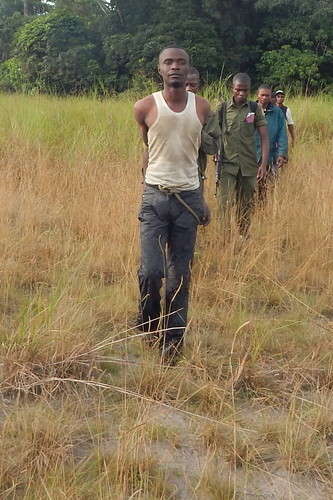 Earlier photo of the Guard, Benjamin, walking the savanna on return from Katopa. Manaka in May at the Kinshasa hospital, fragile but able to laugh. 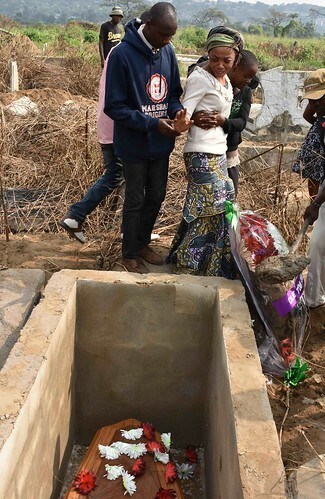 Matthieu, TL2 program manager, with Manaka’s wife by the casket. You drove me many places over several years and even now I can see where we passed together. Given your generosity and your hospitality, you were friend to everyone and everywhere. You were courageous and always available whenever anyone had need of you, early in the morning or late at night. You left us so soon, and we still need to have you with us. As the casket is put in the hearse. 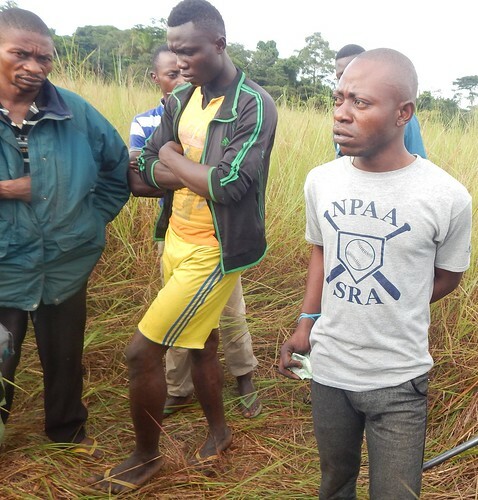 Mourning in Kindu, as in Kisangani, while the burial took place in Kinshasa. This entry was written by Terese Hart, posted on 2017-08-28 at 9:33 pm, filed under About the project, Law and Order. Bookmark the permalink. Follow any comments here with the RSS feed for this post. Trackbacks are closed, but you can post a comment. Oh, so sorry to hear this! I hardly know what to say, that someone would shoot under such circumstances peope he knew and supposedly depended on and then escape so easily. How hard it must be to work under these circumstances. Or maybe much the same thing happens here but it is much more hidden. Glad you are alive, but sad about Manaka. A very sobering post, Terese. Manaka was a very cheery face in Kindu, one I will sorely miss. As I look at Omo each day, I am reminded of the resilience of the Congolese and the passion and dedication put forth to maintain a project like TL2. I will look forward to your sequel, one where Michel answers for his unimaginable cruelty.